It turned out to be a gift from the grave, Happy Again at Last: Life in the Art World, by Robert McGowan. I didn’t know that, though, as I read the book’s fictional short stories, one after another, thirty stories in all, about people who inhabit the world of art and the situations they get themselves into. I thought McGowan was someone I’d like to meet, or at least drop a line to, and, if I were lucky, he and I might begin a professional correspondence. It’s not so uncommon that a writer is also a visual artist, but many of the ones I know of (Elizabeth Bishop, William Butler Yeats, James Thurber, for instance) are dead. And so is Robert McGowan. I didn’t find this out until last night—I like to form my opinion of a book before researching the author and his or her work. McGowan died late last year, after a long struggle with cancer. My own brother died late last year, after a long struggle with cancer. One of McGowan’s short stories, “Little Dead Birds,” concerns dying, imminently, and I’d chalked up its authenticity to the author’s writing power, to his use of candor and detail to bring people alive. Also to kill them off, as I now see. I feel I was part of McGowan’s world in his last days, through his fiction. In “Little Dead Birds,” the narrator probes the lasting value we place on the work we leave behind, and here it’s specifically the artist who’s under the immortality interrogation lights. After questioning ways that we explain, that we rationalize, our lives, the narrator ends the story with “I vanish.” McGowan may have concluded that’s what would happen to him when he died, but he was wrong. I love his book—it’s witty and smart and insightful and perplexing—all the things I like writing to be. And because of my own loss, because of my own grief, McGowan has given me an extra gift: an insight into what might have gone through my brother’s mind in his last weeks, days, and hours. I wish there were a way I could thank Robert McGowan for that. 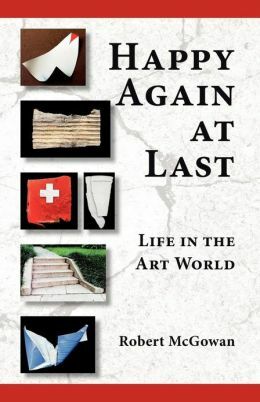 Happy Again at Last: Life in the Art World is an excellent choice if you like to read about artists, if you’re an artist who likes to read, or if you’re searching for a gift for an artist friend. Or if you simply enjoy reading about life. Mary Claire Mahaney is a retired lawyer and author of the award-winning novel, Osaka Heat. She lives in McLean, Virginia, where she writes, edits, photographs, and paints. Visit www.maryclairemahaney.comto learn more and to see her work.